Wikipedia describes academia.edu as a for-profit "social networking site for academics", whose misleading .edu domain name "was registered in 1999, prior to the regulations requiring .edu domain names to be held solely by accredited post-secondary institutions". For my part, I'd describe academia.edu as "a source of large volumes of annoying unsolicited email". Something got me thinking about comments on my website here. Almost no one posts native replies on my posts. I’d have to think that 99.9999% of all the replies on my website are now via Webmention. Perhaps I should cut off native replies just to cut back on the amount of spam I get? Hmmm…. I suspect I’m missing some context, but taking a stab: the bots are hoping you’ll accept/approve their replies so that you put their links on your page for future clicks as well as SEO purposes. Like most spam operations, they just need an ~2% response rate to make the few cents that make doing this worthwhile. I personally blacklist some of the worst offenders by domain name, IP address, or judicious keywords. This is pretty hilarious. I definitely need something like this for my site. Maybe I wouldn’t hate spam calls so much if people weren’t spoofing telephone numbers, pretending that they knew me based on two data points, or they didn’t so obviously sound like they were calling from the noisiest boiler rooms on the planet. If you’re going to try to waste my time you could also be a bit quicker about it. On the other hand it is nice to get old school in person phone spam instead of the auto-dialed, pre-recorded nonsense I have been getting. I haven’t been forced to use it in a while, but I just noticed that six of the last seven comments I’ve left on blogs using Disqus have been marked as spam. Typically they’re well reasoned, thoughtful, and very un-spammy. The one that wasn’t marked as spam was apparently done so by the site owner them self that ultimately noticed the issue and unmarked it. I’m at a loss as to why the system would be marking them this way, particularly given my experience with how other systems flag things as spam. I feel like I’m being moderated out of existence by a poorly written algorithm. 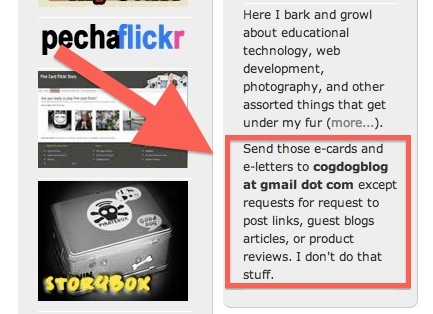 I wonder if the blog owners are aware of what they’re missing out on by using such a painfully dreadful system? I’m not sure what’s changed recently but I went from a few spam comments on my website every week to hundreds a day. Now that I have a larger and more diverse set of post types, it’s become more entertaining to read the incongruous spam posts about how brilliant and insightful I am when I’ve just posted a simple checkin. I thought my writing style on this checkin was great myself, but I didn’t expect to gain this type of acclaim. Spammers are going to have to start using microformats parsers to know which post types to properly add their spam to in the future. I did not know that that the famous Monty Python spam sketch was recorded on 6 June 1970. At least, that’s the claim of a Tumblr obsessed with Minnesota in the 1970s. (Wikipedia says only that “[i]t premiered on 15 December 1970”.) However, I need no encouragement to share a programme on Spam that I made for BBC Farming Today back in 1997, a programme that was both very well received and a blast to make. the people at Hormel couldn’t have been nicer, and the butterfly spam balls weren’t bad either. There’s so much more to spiced ham than one could have ever thought. It’s not only a great slice of Americana, but there’s some science and interesting economics behind the things that go into making it. Both a fun and fascinating episode. There are potential solutions to the recent News Genius-gate incident, and simple notifications can go a long way toward helping prevent online bullying behavior. There has been a recent brouhaha on the Internet (see related stories below) because of bad actors using News Genius (and potentially other web-based annotation tools like Hypothes.is) to comment on websites without their owner’s knowledge, consent, or permission. It’s essentially the internet version of talking behind someone’s back, but doing it while standing on their head and shouting with your fingers in their ears. Because of platform and network effects, such rude and potentially inappropriate commentary can have much greater reach than even the initial website could give it. Naturally in polite society, such bullying behavior should be curtailed. This type of behavior is also not too different from more subtle concepts like subtweets or the broader issues platforms like Twitter are facing in which they don’t have proper tools to prevent abuse and bullying online. On March 25th, Ella Dawson wrote a blog post in which she requested that Genius disable its Web Annotator for her site. I think that a major part of improving the issue of abuse and providing consent is building in notifications so that website owners will at least be aware that their site is being marked up, highlighted, annotated, and commented on in other locations or by other platforms. Then the site owner at least has the knowledge of what’s happening and can then be potentially provided with information and tools to allow/disallow such interactions, particularly if they can block individual bad actors, but still support positive additions, thought, and communication. Ideally this blocking wouldn’t occur site-wide, which many may be tempted to do now as a knee-jerk reaction to recent events, but would be fine grained enough to filter out the worst offenders. Perhaps there’s a way to further implement filters or tools (a la Akismet on platforms like WordPress) that allow site users to mark materials as spam, abusive, or “other” so that they are then potentially moved from “public” facing to “private” so that the original highlighter can still see their notes, but that the platform isn’t allowing the person’s own website to act as a platform to give safe harbor (or reach) to bad actors. Further some site owners might appreciate gradable filters (G, PG, PG-13, R, X) so that either they or their users (or even parents of younger children) can filter what they’re willing to show on their site (or that their users can choose to see). Certainly options can be built into the annotating platform itself as well as allowing server-side options for personal websites attempting to deal with flagrant violators and truly hard-to-eradicate cases. Note: You’re welcome to highlight and annotate this post using Hypothes.is (see upper right corner of page) or on News Genius. Do you have a solution for helping to harden the Internet against bullies? Share it in the comments below.